Most people who read my blog on a regular basis know that I write every single day of the week, either 2 hours in a row (from 4:00am to 6:00am), or in 4 blocks of 30 minutes every day, to ensure at least 10 hours of solid writing per week. What most people DON’T know is that most of this writing is generative. That is, I generate new text, I write new papers, but I am horrendous at editing, or at getting out manuscripts that are languishing. I've had a manuscript for a journal languishing since July 2012. It's getting sent this month, I don't care how. Time to send off! In my terminology, “languishing” means that conference paper that I wrote, that was very well received, but that somehow, in the past two years, has been slipping through the cracks. Or a paper that is THIS CLOSE to being complete, but only needs a bit of editing or polishing, or adding a few interviews, or cranking out a few equations or rewriting the analysis. So, it’s a paper mostly done, but that is there, sitting in my hard drive, alone and waiting to be submitted to a journal. I’m tired of this. I’m tired of only writing generative text and I’ve decided to simply start polishing those manuscripts that are ALMOST done, but that for some reason, I left behind after conferences or workshops. So, in a conversation with Steven Shaw from McGill University in Montreal and Mireya Marquez from Universidad Iberoamericana in Mexico City, we decided that we wanted to find an accountability mechanism to bring us to completion and submission of manuscripts. So that’s how #GetYourManuscriptOut started. 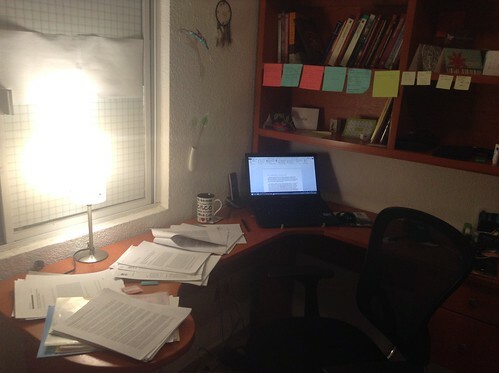 Mireya, Steven and I collectively are inviting all academic writers to use the hashtag in the way many use #AcWri (Academic Writing), to share frustrations, ideas but most importantly, progress about a manuscript that needs to get out. In turn, we’d probably appreciate words/tweets of encouragement along our journey. - The manuscript on wastewater governance I wrote for my job talk needs to be submitted. It’s almost 100% ready and I just need to polish it. - The paper on remunicipalization needs to be polished with additional interview material from the case study. It’s also almost done, and just needs to be reworked with the interviews and submitted. - The design for my water culture experiment needs to be written up. - My paper on bottled water needs to be submitted, as it needs to be reworked to use the citation style of the journal I’m planning to submit.
.@Miremara We need to get them out. We should build a support group #GetYourManuscriptOut like #AcWri, an accountability mechanism. If you have manuscripts waiting to be submitted, that are ALMOST done, and you need collective encouragement, do feel free to join in. We won’t be tweeting on a particular day or at a particular hour of the day, we’ll just be citing our progress and asking you to keep us accountable and encourage us. Tagged with academic writing, AcWri, GetYourManuscriptOut. Also #GraftonLine on Fb — very similar idea. See article in InsideHigherEd about it a few months ago. I’m joining too. I’ve got a draft that is OVERDUE and I feel serious shame. I have the opposite problem to you, Raul: difficulty in generating new papers – or, as I like to call it, “that sodding white page” problem. I am efficient at writing, but I struggle to put together THAT first sentence which just gets the paper rolling. @ Annemarie – glad you’ll join! I had a walk with a friend late last night. I lamented about how I couldn’t get back to completing the last 2 chapters of my Dissertation or the short paper someone suggested I submit to a journal to vet my thinking. My friend read your post this morning, sent this me and said “It’s as if God was listening.” Please tell me how I can join #GetYourManuscriptOut now. Thanks!